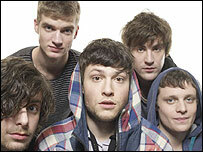 Brighton band The Maccabees are poised to release their quirky-titled new single Toothpaste Kisses. 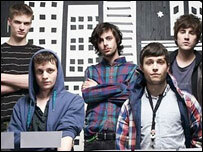 The indie five-piece spent 2007 touring the US and UK, and released their debut album Colour It In. Guitarist Hugo White discusses the band's music, their hopes for the future - and the "extreme kissing" in their latest video. How did you hit upon your name The Maccabees? When we first started the band we just picked books off shelves, flicked through pages and pointed to names. We picked up a Bible, found Maccabees and thought it was a good band name. We didn't know what it meant but found out later. What is the "extreme kissing" in the video for Toothpaste Kisses all about? We try to get creative people that we know involved in our videos. My auntie is a choreographer and it was her idea. It involves a number of people kissing and is quite athletic. It even had men kissing men and women kissing women. Tell us about the content of your music, it's quite romantic. Orlando [Weeks] writes all the lyrics, but a lot of it's about writing what we genuinely know about from friends, family and some of it comes across romantically. He talks about things close to home and wears his heart on his sleeve. How do you work together musically? We write all the songs together as a band and they might, say, come from a bass line with Orlando's lyrics on that. From the start - about four years ago - no-one in the band was a great musician because we were learning. We played together and learnt how to write songs together. I think it comes across that it's our own thing. And what's keeping you busy at the moment? At the moment we're writing the second album and in the rehearsal room every day after 18 months of solid touring. After playing the songs from our first album so many times, you feel that you want a whole new set. Which part of the creative process do you prefer? Playing live and making records are both amazing. You can never imagine what you do in rehearsals is going to amount to at gigs, playing to thousands of people. Seeing our songs appreciated is a massive incentive to write the best music. It's the best job that I can think of having. Are there any other artists you would really like to work with? I'm not sure about writing songs with someone else, but we're really hoping at some point on our next album to work with Richard Hawley as a producer. We did a cover of one of his songs and he's been really helpful to us. What do you hope to achieve in 2008? We want to record our album by February and play in time for the festivals. We're not going to be a stadium band and don't want to lose that intimacy we have, but want to play to more people. When we performed at The Roundhouse in London last year if felt like we'd earned it. Do you dream about winning Brits and the Mercury Prize in your career? We're really not bothered about that. It's not why we make music. We just want fans to be involved in what we do and feel a part of it. We don't want to lose that. Are you worried about where Toothpaste Kisses lands in the chart? To continue doing this we need to have a certain amount of success. It's expected to do better than our previous singles and has been played on Radio 1 which can change everything for a band. Toothpaste Kisses by The Maccabees is released on 7 January. The band's Hugo White talked to BBC News entertainment reporter Michael Osborn.